Can A Shower Clock Help You Save Water? When you take a look in your bathroom, what gadget do you think is missing or could be useful to your personal time? Helping you save time and money, a shower clock , aka shower timer is a gadget that tracks how much water you are using and/or how much time you are spending while in the shower to then remind you of when to turn the water off. When you think about it, shower clocks are essential because of how they can help you in several ways. First, they can help you with your morning routine. As it is easy to get off track from your schedule,Â shower clocks can help you limit your time in the bathroom and make you more aware of exactly how much time (and water) you are wasting. A shower clock can also help save energy and lower your water bills. People often like to let the shower run although they are not using it at the moment. With a shower clock, you will be more inclined to make good use of the shower water during the time allotted. Because of this, more people are able to conserve water and cut down on their bills. The shower clock does not only have to be used in the bathroom, either. They can be placed in your bedroom or over the sink in your kitchen to monitor other tasks that are a part of your daily routine. AM Conservation SS010-S-BLB STOP In Time Shower Timer – This water proof 5 minute sand Shower Coach timer from AM Conservation is easy to install. Simply affix the suction cup on the back of the shower timer to the wall. When you start your shower, rotate the shower timer so that sand start to flow. When the sand has stopped flowing, your 5 minutes is up. 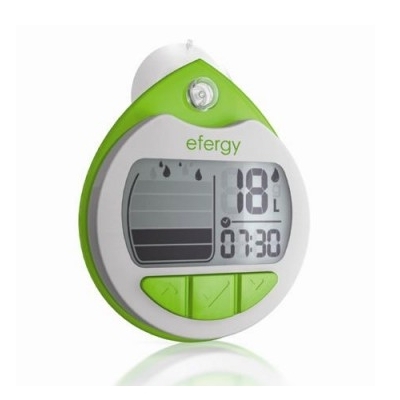 Efergy Shower Timer and Alarm – This newly redesigned easy to use, battery-operated, shower timer allows you to monitor the amount of water you use at every shower. Quickly and easily calibrate it to your shower by using the measuring bag supplied. We recommend no more than 35 liters (9.25 gallons) or less than 4 minutes. Use the lanyard supplied to hang it on your showerhead, or affix it to the wall using the suction cap. Turn on the timer every time you shower and follow the progress on the visual display. The alarm will sound when you have used your target volume of water. Showertime Shower Timer – This simple device will gently remind users when it is time to turn the shower off. To install, use either the suction cup or adhesive back to adhere the Showertime in a visible location on the wall of the shower. Press the bottom portion of the Showertime when you step into the shower, and a blue LED will illuminate. After 4 1/2 minutes, the blue LED will change to a flashing red LED for 30 seconds, serving as a convenient reminder of the amount of time that has elapsed. To answer the question at hand, shower clocks can absolutely help you conserve water along with other perks like saving money as well. Investing in your own is an easy step towards living an environmentally-friendly life. Water is life.We need to establish ways of conserving the little water we have.Water harvesting need to be embraced.The water sources also need to be protected.The water we harvest will be used during dry seasons. Thanks for creating awareness.